I wouldn't say that he HATES reading. I think "It's not his favorite thing to do" paints a more accurate picture. But part of that apprehension has developed because he has watched his sister's reading blossom while his SEEMS to remain stagnant. Or, at least that's what HE thinks. The truth is, so often a child who is "struggling" to learn to read can't see a steady progression of improvement. What they read yesterday seemed hard. What they are reading today seems hard. And (in their mind), what they will read tomorrow will be harder still. Their view of their reading skills...or lack thereof...becomes a bit myopic. They fail to remember that the sounds and words they learned to read at the beginning of the year seemed hard because they were hard...THEN. Those same sounds, at the end of the year, are quite easy because they have had a year's worth of practice at them. Unfortunately, when teaching a child to read, it is necessary to provide GRADUATED reading material...a series of books that increases in difficulty...in order that the child's skills may be stretched and grown. At the beginning of the year, you provide simple sentences such as "The cat sat." By the end of the year, you can give more complicated reading such as "The large kitten pounced on the small mouse." Both are HARD to read...at first. But the graduated reading lessons will render the first sentence much easier to read as the year progresses. So, where does the "encouragement" part come in? 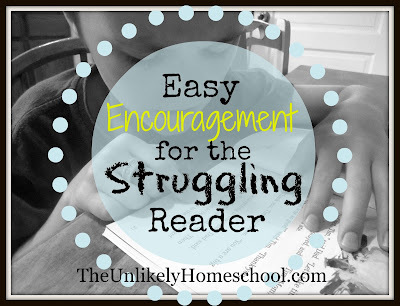 I have found that one of the easiest ways to "encourage" a struggling reader is to record his/her reading practice at varying stages throughout the year. This is what I did the very first day of second grade for my son, who while I would not classify him as a "struggling reader" because he CAN read, has had a poor view of his own reading since he first cracked the mystery of letters in kindergarten. I recorded him reading LESSON 1 in his reading book. I plan to revisit that same story in four months and then again at the end of the year. I will record each session and play them all back to him at the end of the year. Barring some year-long, phonics-related catastrophe, he will obviously improve throughout the coming months and this simple LESSON 1 story will come out smoother and smoother with each additional recording...giving him tangible proof that his reading HAS improved. I will, then, be able to say to him, "Yes, each reading lesson has been difficult, but in the BIG PICTURE of reading, look how far you've come!" What a great idea! I think I'm going to do this with my third grader, too. Or maybe with all my children in one form or another. What child wouldn't love to see the amazing progression they are able to make over the course of a school year! Thanks for the lovely idea! 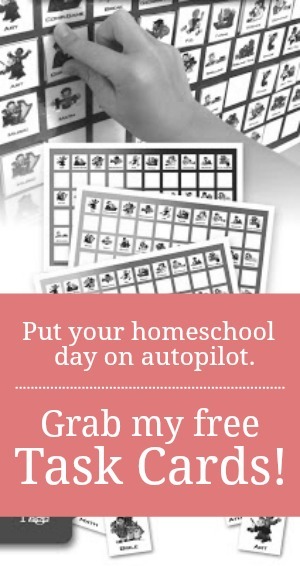 it is truly a great idea, easy to do, but am sure will help kids build up confidence. I just can't believe the similarities in our kids. Our daughters sound very similar school-wise and now our sons do as well! Crazy! It must be a birth-order thing. Oldest girl...second-born boy. Too funny! I love your idea about recording them reading. I think that's just what my son needs to see. He's very driven by tangible proof. I can tell him how good he's doing all day long and it doesn't sink in, but to actually see and hear himself on video doing it, now that's something special (and indisputable!). Yes. So many kids are like that. Tangible proof is always great!